I read an article in New Scientist about Symplectic Geometry back in 1994 and coded the first algorithm. The core code is only a few lines in quick basic (and I even managed to code those incorrectly at first). 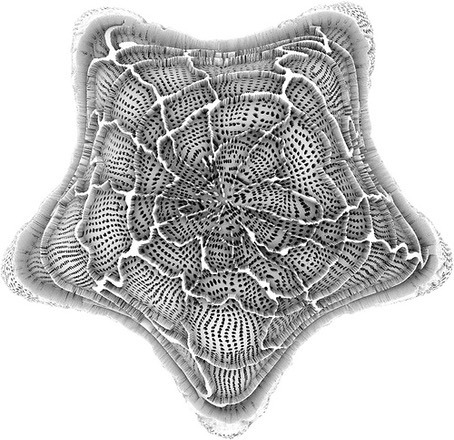 Some of the images reminded me of diatoms (images below). Left and right diatoms. These are microscopic particles that form colonies. The patterns were similar to the patterns on my computer. Some looked like diatoms while others looked more exotic and the name "Orchid Fractal" stuck for a while due to the shape of this specific image (which reminded me of a Bee Orchid). "March 1994 brought an article in New Scientist magazine about something called symplectic geometry, one ingredient of chaos theory. 'Symplectic' just means 'complex', but its mathematical associations are those of the complex numbers, in which minus one has a square root. In symplectic space a line is always at right angles to itself. Symplectic geometry includes velocities as well as positions, it is a geometry of motion. Well, he needed a new geometry, and since this one was on offer... He entered some sample formulas into his computer, trying to use symplectic geometry to model the motion of individuals in crowds. Suddenly, on the screen, in vivid colour, growing before his eyes, were the most striking, mysterious, and downright beautiful images that he'd ever seen. There were hundreds of them, thousands, millions. Every new 'seed' number that he fed his computer produced a new and different image." 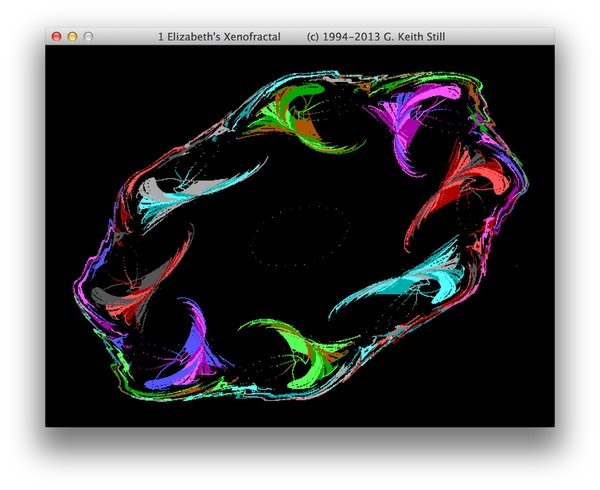 Although these are technically Strange Non-Chaotic Attractors (SNA's) I named them XenoFractals as the algorithm is iterative and combinatorial on several levels. So what is a SNA? 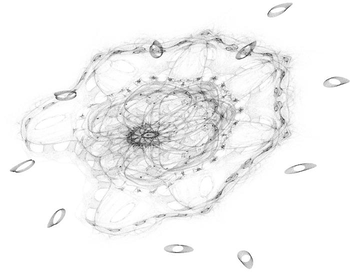 Strange Non-Chaotic Attractors arise commonly in systems subjected to quasiperiodic forcing. 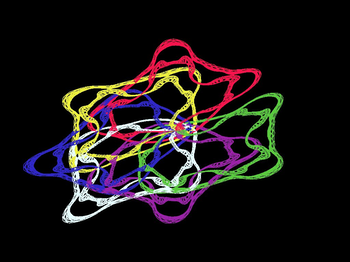 A SNA has a complicated (fractal) structure but does not have a positive Lyapunov exponent - trajectories separate at rates that are slower than exponential. So the patterns (as you can see in the numerous video clips on this site) grow on the screen. The Xenofractals have both a fractal dimension and are self similar (for example the Galaxy Xenofractal seen in deep zoom has recurring patterns at different scale). An interesting property is that they can be driven with data - the heart rate variability experiments proved to be very accurate and interesting in detecting chaotic signatures (or lack of as the case turned out to be).